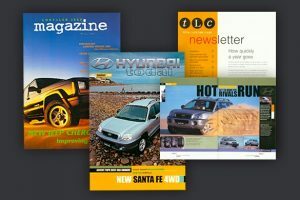 Hyundai Automotive Australia – For 12 years Wanted produced Hyundai Todai, the 40-page full colour quarterly custom publication. Each issue had a print run of 40,000 copies which were distributed nationally through dealerships and direct mail to the customer database. Kate strategically designed the magazine to exploit the freedom and range of communication opportunities the magazine afforded. A physical brand ambassador put directly in the hands of prospective buyers at dealerships and existing customer through the mail, was the ideal public relations vehicle to foster engagement with the brand on a professional and personal level. Information included release of new models and product information, announcing new product developments, customer feedback and goodwill enhancement through regular promotions and give-aways, after sales service, sales information and initiatives, extending the value of sponsorship, company and international news, consumer research and dealership promotion and support. Working with a seasoned auto industry journalist, an excellent graphic designer and professional photographers, Kate identified and sourced editorial content, promotion partners and sold advertising inventory, conducted and analysed research campaigns and promotions, and managed editorial, art direction and production. 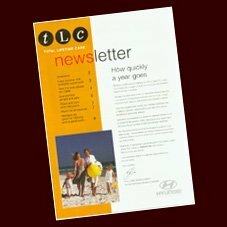 Over the years Wanted also produced many other marketing projects for Hyundai including the TLC loyalty campaign, customer promotions and research campaigns, plus the Chrysler Jeep magazine. Despite several changes at Hyundai of advertising agencies, management and marketing personnel, Wanted produced the magazine exclusively throughout the 12 years on a contract that was renewed annually.